The simple truth is that we are all embodied, enlightened beings. Realizing this simple truth liberates us from a world of suffering. However, realizing this amidst perpetual distractions and coming attractions of daily life is often a bit more complicated. Fortunately, some of the embodied, enlightened beings who realized this before us, in their infinite wisdom and compassion, composed the ultimate guide to liberating Self-realization: yoga. Believe it or not, for thousands of years, long before modern-day mat-work was even a twinkle in a guru's third eye, yoga was (and practiced as intended, still is) the ultimate meditation practice. In fact, one of the most challenging aspects of teaching yoga today for educated teachers is the widely-held misconception that yoga is merely asana. 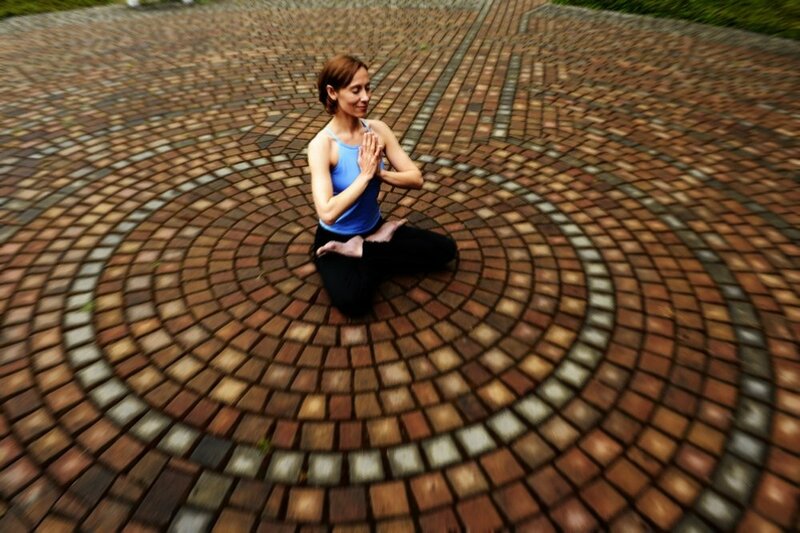 While the ubiquitous, body-bending asana practice is indeed yoga, it is only a fraction of the much richer, mind-bending practice of yoga that includes ethics (yamas and niyamas), postures (asanas), breathwork (pranayama), sensory regulation (pratyahara), concentration (dharana), and meditation (dhyana and samadhi). The widespread misappropriation of the term "yoga" to refer to asana practice alone only perpetuates the misconception, which is why even knowledgeable yoga teachers will often advertise "yoga" and "meditation" as if meditation is something in addition to yoga rather than the essence of all yogic practice. In deference to contemporary yoga culture that assumes "yoga" means postures, I often refer to "yogic meditation" or "yoga as meditation" to avoid misunderstandings despite the fact that "yoga" and "meditation" are historically somewhat synonymous. Yoga is the practice of coming home to our embodied, enlightened selves by giving ourselves careful, mindful attention—consciously relaxing the body and awakening the mind to experience the inherent wholeness within, between, and all around us that often remains unrealized in our day to day experience of ourselves, each other, and the world. The foundational texts of yoga—the Yoga Sutras of Patanjali, Bhagavad Gītā, Hatha Yoga Pradipika, and Upanishads—all describe yoga as a process of enlightenment consisting of expanding our sense of identity beyond ego consciousness, or self with a small "s," to rest in the immortal Self (ātman or Self with a capital "S') that is one with all that is (brahman). This identity is always available to us. Realizing this expanded sense of self as who we really are is actually the paramount purpose of yoga. Sometimes, we awaken to our true nature in an instantaneous flash of insight. More often, it's a gradual transformation that occurs over time with consistent, dedicated practice. However it happens, the result of consistent yogic practice is a restful body and peaceful mind that lead to liberating Self-realization. In the Yoga Sutras, the three-fold method for realizing our true nature is referred to as samyama, consisting of dharana (steadfast attention on an object), dhyana (inward contemplation or attention on the subject as object), and samadhi (complete absorption or subject/object integration). Generally, yogic meditation proceeds from the intention to realize One Self by focusing our attention on the more external, concrete aspects of our experience like the sensations of the body and the energy of the breath (asana and pranayama), gradually bringing our attention inward (pratyahara), concentrating our attention (dharana) on more internal, subtle aspects of our experience like thoughts, emotions, the silent space between thoughts, the spaciousness beyond thought, our sense of self or “I”dentity until our “I”dentity remains in one-pointedness (dhyana) resting in the eternal, infinite unity of all that is (samadhi). All genuine meditation practice is grounded in the desire to relieve suffering. Usually, what begins as a desire to relieve personal suffering becomes a commitment to alleviate universal suffering as we discover the delusion of separation—of mistakenly thinking that we are independent, separate beings—that is the root of all suffering. As we realize ourselves in each other and the world, we transcend our egos, expanding our identities to include the universal or One Self within each and all. Traditionally, ethical good-standing is a prerequisite of meditation practice, without which meditation practice is simply self-indulgence dressed up as self-awareness. Yogic meditation practice begins with an intention to realize the Self at the heart of each and all—the universal Self beyond the personal self that serves each and all. Recognizing that harm to one harms all, we extend our compassion to all living creatures. Despite the growing popularity of mindfulness teachings, mindfulness without harmlessness (or insight without compassion) is incomplete. Compassion is how genuine meditation practice shows up in the world. Thus, at a bare minimum, when one begins a meditation practice, one must aspire to do no harm. Sustaining the health of the body is actually an often overlooked, essential foundation for meditation practice. Meditation practice is designed to fundamentally alter one's perception of oneself and one's reality. This can be both ecstatic and disorienting. Anchoring one's meditation practice in a healthy body balances the transcendent awareness of enlightenment with the functional awareness of embodiment. When we can't sit comfortably for extended periods of time, it is far more difficult to concentrate and meditate. Physical aches and discomfort distract us, preventing us from experiencing the relaxation that supports more meditative states. Moreover, a healthy body offers necessary grounding and refuge. Traditionally, asana practice was used as needed to develop a healthy body capable of sitting still in meditation. Before meditation, it may be helpful to do a few gentle stretches, asana postures, Moon Salutations, or Sun Salutations to help center, balance, and relax. Particularly when we are concentrating, many of us tense our bodies unnecessarily. Moreover, the habitual overstimulation and overwork characteristic of modern life often leads to chronic stress, tension, and inflammation. Even when we are at rest, we are often not rested and relaxed. Meditation practice is an opportunity to reconnect with the subtle sensations of our bodies, and consciously develop habits of relaxation and awareness that support greater health and well-being. Seat yourself in a comfortable, upright position, and be still. If comfortable, sit on the floor or on a small cushion cross-legged, in half or full-lotus, or kneeling siting on your heels. If sitting on the floor is uncomfortable, sit on a straight-backed chair. What matters most is that you sit in the position that best supports you in sustaining a relaxed, upright position without straining or slouching. If you feel cold, place a wool or silk blanket under or around you. Scan your body. Notice any restlessness or tension, and release it. Lengthen your spine and drop out of the shoulders. Feel the support of the ground beneath you. Let yourself become calm, grounded, and centered. If you still feel restless or tense, practice some simple Tense & Release or Progressive Relaxation exercises as a way of releasing any residual tensions stored in the body. Rest your attention on your feet and gradually, move your way up the body, gently tightening and releasing your muscles along the way. Breathing deeply engages the "rest and digest or relaxation" response, calming the body and focusing the mind. Bring your attention to your breath. Relax your belly without slumping. Relax your jaw. Relax your eyes and the space around your eyes. Take a deep breath. As you exhale, imagine that you are exhaling all the air in your body. Inhale a calming breath, counting to 4. Pause before exhaling for a count of 2. Exhale for a count of 4. And repeat for a few minutes, increasing the ratio to 6:3:6, or 8:4:8 if and as the breaths become longer. You may add a pause after each exhalation too. Then, relax any efforts to control your breath and let your breath flow naturally. So much of our attention is directed externally, captured by the manifold sights, sounds, and happenings around us. Yet, we all need time to retreat, drawing our attention inward beyond the day-to-day clutter and clatter of ordinary existence. One of the eight foundational limbs of traditional yoga practice is pratyahara or withdrawal of the senses, an intentional turning inward beyond the sensory distractions of the outer world to experience the profoundly sacred aspects of being that naturally arise when we immerse ourselves in the quality of attention usually reserved for that and those we adore. Without this intentional, reverent attentiveness, what is most essential is often both overwhelmed and overlooked. Close your eyes and focus your inner gaze on the still point between your eyebrows or the center of your heart, whichever resonates more strongly for you and best holds your attention. Let the silence beyond sound fill your ears. Focus on the feeling of the breath as it flows in and out of your nose. If it is helpful, repeat a mantra (sacred word or phrase) with each breath. Two traditional mantras that flow easily with the breath are Hamsa (pronounced hahmsah) and Soham (pronounced soehummm). In English, Hamsa translates as an enquiry, Who am I? Soham translates as an answer, I am that. When you are skilled in sustaining your attention on the present moment, bring your attention to both the breath and your internal gaze to the space between the brows or within the heart. Focusing attention on the breath helps one stay in the present or now. Focusing attention on the space between the brows or heart center helps steady oneself in space, as in here. For most of us, it is initially challenging to stay here and now for any length of time. Our attention inevitably wanders, distracted by sounds, sensation, emotions or thoughts. Whenever you realize that you've wandered off, simply bring your attention back to your breath and stillpoint within. This practice of repeatedly bringing your attention back to here and now is the stabilizing practice of concentration (dharana). Dharana corresponds to shamatha practice of Buddhist meditation. As our concentration skills deepen, we gradually focus our attention on more internal, subtle aspects of our experience like thoughts, emotions, the silent space between thoughts, the spaciousness beyond thought, our sense of self or “I”dentity within the greater field of awareness. Sometimes, this is referred to as witnessing consciousness, which corresponds to the widely popular vipassana or mindfulness meditation. When we learn how to concentrate, we are nowhere, completely focused on here and now, undisturbed by worldly activities, bodily sensations, and mental thought-streams within the field of awareness. When we can sustain our attention on a point of focus for a period of time without distraction, we experience meditation (dhyana). We are nowhere and now here. Ultimately, the "I" (observer), focusing and witnessing (process of observing), and the breath/stillpoint (object of observation) collapse or merge into one seamless experience. Our “I”dentity rests in the eternal, infinite unity of all that is. In the yogic tradition, this is called Samadhi or transcendent awareness. Yoga rests in the simple truth that we are all already embodied and enlightened. Realizing this is life’s purpose and results in the experience of profound freedom. Meditation practice is the process of coming home to yourself by paying attention to yourself—consciously awakening and integrating the various layers of your experience within the inherent wholeness that is already you. Generally speaking, we begin by focusing our attention on the more external, concrete aspects of our experience like the sensations of the body and breath, gradually bringing our attention inward, focusing our attention on more subtle, abstract aspects of our experience like thoughts, emotions, the silent space between thoughts, our sense of self until our “I”dentity rests in the eternal, infinite unity of all that is. Each object of focus realizes a new subject that becomes the new object until subject and object become One.